Like to snorkel? Interested in supporting emerging marine engineers? 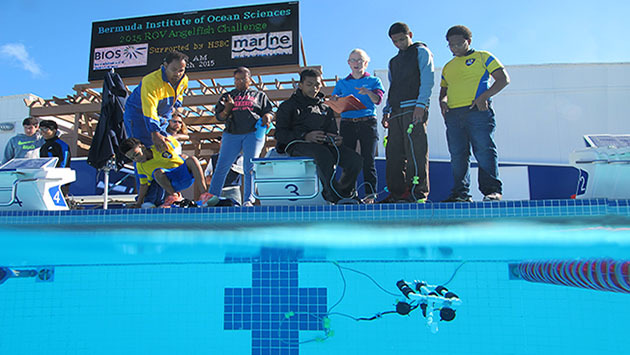 Volunteers from BIOS and the Bermuda community are needed to assist on Saturday, April 30th as 33 teams of middle school students test their mission-tasked Remotely Operated Vehicles (ROVs) during an island-wide robotics challenge. The competition, held at the National Sports Center pool in Devonshire, is the culminating event of the Mid Atlantic Robotics IN Education (MARINE) program, which encourages students to develop and apply technical, teamwork, and problem solving skills. This fall, teachers participated in a two-day workshop on marine engineering and are now working with student teams to develop underwater robots from kits. During the April event, students will put their designs through a series of maneuverability and speed challenges. The day will also include in-water and marketing demonstrations for the students’ ROVs. Awards will be given to students for a variety of accomplishments, including for teamwork and team spirit. This year’s event marks the first time that Bermuda will host a regional competition in conjunction with the U.S.-based Marine Advanced Technology Education Center. “We had a great turn out of judges from BIOS last year,” said BIOS educator Kaitlin Baird, a coordinator of the competition. She said that approximately 20 volunteers are again needed for snorkeling in the pool and for judging the competition on the pool deck, and must be at least 16 years old. Interested individuals may contact Baird with their preference for judging in the water or on the pool deck. The commitment will require one 40-minute meeting the week prior to the competition.